Thank you now-disinherited seven-year-old granddaughter. There are parts of the body that, although always with us, we pay little attention. I admit that most of the time I ignore certain body parts. For instance my ears, imbedded on either side of my head, are forever with me. Sometimes I stick a pair of earrings in them. Most of the time my hair covers them. My morning and evening routine does not include devoting time to my ears. The same with my knees. There they rest, connecting my legs and thighs, doing their job flexing my leg forward and backward, allowing me to walk, bend down, or simply swing my foot back and forth while sitting on my kitchen stool. Some days my knees work better than other days, but they remain quite functional, although not as flexible as decades ago. Knees get dirty, especially when gardening, so occasionally they get a good scrubbing. Otherwise, I pretty much ignore them. But I guess that has to change. Sitting on my lap, up close and personal, it was inevitable the kid who speaks before thinking would blurt out a truth wiser folk would leave unsaid. Not that I have long hairs sticking out of my nose. I cannot braid them or curl them or color them or mousse them. Standing on one side of the sink, staring at the mirror, they are unseen tendrils in the midst of my face. I have to put my head way back to actually see the hairs. Perhaps I do not see them immediately because my eyes are not as keen as they used to be. Maybe I do not notice because I do not want to deal with another declining feature of my aging body. Sometimes things remain unseen because they have become a part of us and, scanning our image in the mirror, do not observe what is right before our eyes. Unless we take a few minutes and look very closely, and ask some serious questions. Whose face is staring back at me? Where did those minute facial lines come from, and how long have they been there? Look at those teeth. I need to whiten them. Are my ears getting bigger? 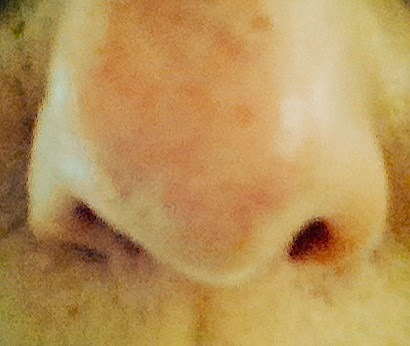 And right in the middle of my face, silently daring me to look closer, is my nose. Now I have another aspect of aging to worry about. Do I buy a device like a nose trimmer to zap the critters? Do I cut with a scissor? TV medical guru Dr. Oz advises not pulling the hair. He suggests cutting them with a curve-tipped scissor. Life is getting more complicated. Wasn’t there a time when children were supposed to be seen and not heard? I shudder to imagine the next revelation spewing forth from any of my grandchildren’s cute but distressingly honest mouths. There is nothing more humbling than have a seven year-old in one's life. My particular 7-yr-old is brutally honest about arm flab. I sympathize with all of the above . . . although I do pay a lot of attention to my knees, mostly because they Don't work too well. But what gets me the most is the shrinking. What's that all about? I just got back from having my face waxed. My seven-year-old quote is, "Grandma, why are you fat?" Our ears,nose and chin length then as we age. That's why very old people appear to have chins that curve up toward their downward turning noses. Hairs...why do they groa where you don't want them? David is beginning to look like a bald-headed werewolf. Congratulations on winning BlogHer15's Voices of the Year for this post! Please contact carolyn.lukiewski[at]sheknows.com with your mailing address so she can send you your award.